It is very important when pregnant to take all the vitamins that are required to instill a healthy baby. I know when I was pregnant I took a extra pill that contained DHA for baby I felt really good taking it knowing my baby was getting the best nutrients as possible. It comes in liquid form so after the baby is born you can add this in their bottle or just give it to them by mouth. And the pill form is great for mother to take while she is pregnant. Made exclusively from Gold Standard Arctic Cod Liver Oil™, Nordic Naturals Baby’s DHA is a safe and effective way to ensure that growing babies get the DHA they need for healthy development. * Like all Nordic Naturals fish oils, Baby’s DHA is third-party tested and surpasses strict international standards for purity and freshness. 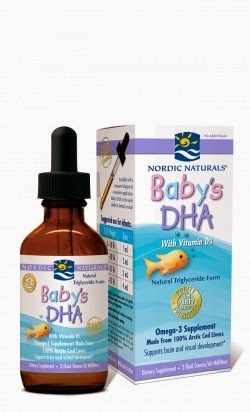 Would you like to win this set of Nordic Naturals Baby's DHA?? Enter the Rafflecopter Below for your chance to win!!!!!! I do use vitamins each day and Omega and also flax seed and calcium to try to stay healthy. I decided to start eating the way I feed my daughters, since I make sure they eat healthy, natural foods. Since then, I have much more energy to keep up with them. We also take multi-vitamins each day.